When we were given Emma's diagnosis it was basically said in passing. It was assumed that I already had a diagnosis. I will say though that after the initial ripping off of the band aid the medical team was incredible. They were kind and very positive. My dear friend Robin was not so fortunate. The first few weeks are so crucial. 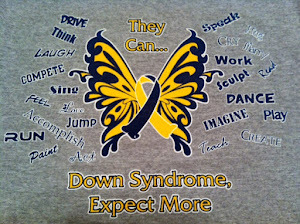 Parents need to understand that Down syndrome is nothing short of GREAT in our world. Great video for the medical community and new parents. I can not wait to see what the next generations achieves.